Good morning Leo and thank you! TBJ listed all the building permits for this project in Friday’s print edition. I am going to assume this will be the shortest building in this Kane project. I expect the rest to be 15 stories +. Though Kane might put in some of those 7 story mid-rise Apt. complexes, I just don’t see that happening. the land is too valuable not to go tall, and Kane wants to make a statement. Site work and foundation typically seems like it takes a painfully long time to complete. This is exacerbated for this project due to the creek (both uncovered and covered). Once this foundation work is completed, it’ll start moving more quickly. I ran by One Glenwood tonight and saw it has topped out. And the parking deck is making fast progress now. Is that hotel still supposed to be 7 stories? The renderings on its website suggest yes, but wasn’t sure. Does anyone know if there will be a webcam for The Peace? Per the State of Downtown. FNB tower groundbreaking May 3rd. Drew, great news. So First Natl Bank tower is 22 stories? How long has it since Raleigh has had a 20+ tower under construction? 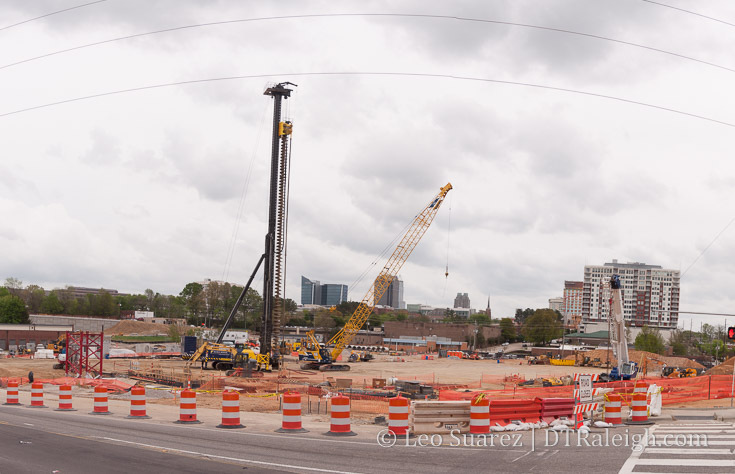 At least Durham has their 23 story (new tallest for Durham) underway. Last one was probably Skyhouse. -This is the property directly West of Red Hat amphitheater. Here is a link to their website which includes drone footage. @ Evan , Do you know if 316 feet is still correct ? Thanks ! FNB is also building a tower in Charlotte and it will be 33 stories tall. I thought Raleigh was going to be the regional HQ. Why is Charlotte getting one also? Correction, 31 stories for the Charlotte FNB tower. Based on FNB’s press release, I’d say that’s because Charlotte is also getting a “regional headquarters.” The “regions” in question appear to be the Triangle and Metro Charlotte. It might also be that they split the state in half. For the record, the press release does refer to the Raleigh HQ as the “Raleigh Region HQ” and the Charlotte HQ as the “Charlotte Region HQ”. Lol I would hope the Raleigh hq would be DT Raleigh. I’m pretty happy about this groundbreaking date announcement. With so much banking in North Hills, I thought maybe FNB was pursuing that location instead of DTR. I’m a “wait until groundbreaking” kind of person so color me ecstatic. I’ll be there to see for sure! @Jeff, I think that I remember hearing that the FNB tower is limited in height by foundation that’s already built as part of the garage below it. FWIW, I am happy that this will be 22 real floors and not a tower that’s built on top of a parking pedestal. I remember that limitation as well. Ditto on John’s point, no parking pedestal. 290 feet. A hair taller than Duke Energy tower. But only because of the angled crown thing. The top floor of Duke will technically be higher than the FNB’s top floor. And yet the Edison site is still just a dirt parking lot. Why not there? I don’t understand why that developer is waiting on a company to sign up for leasing office space. If you believe what is mentioned in the State of Downtown Raleigh pdf office leasing rates are at an all time high but what company wants to wait two plus years to get an office built when there’s plenty of office space elsewhere? Saw where the City is ‘delaying’ considering funding for Sir Walter as affordable housing. I REAAAALLLY hope this is the beginning of the end of that being an option. Surely there are more affordable options from a taxpayer perspective, not to mention overall safety and amenity perspective that the City can offer these 100 residents rather than what would be a HUGE missed opportunity to convert the building back to its original purpose and finally give Raleigh the ‘grand old hotel’ that it should have. City of Raleigh: PLEASE KILL THE AFFORDABLE APARTMENTS OPTION FOR SIR WALTER!! Thomas, I tossed out the idea in other forums, of the City buying the NC Association of Educators land, adjacent to the Exploris Middle School proposed site, and replacing (or increasing) the amount of senior/affordable units there. For folks that can get around, there could be shared open space with Exploris. You could incorporate a pharmacy fronting South Street, the site still accesses Fayetteville St pretty easily and generally results in just a short move and a more efficient use of available land in the area. You could even run a trolley to Dix from there. If you really wanted to go big there, combine it with Glenwood Towers residents and gain more efficiencies and height. To answer Fran’s question: It mostly has to do with the banks and loan terms. Most developers have to wait till a certain number of pre-lease commitments before they are able to secure debt financing. I’m not 100% clear on the exact percentage but it can be as high as 70% pre-committed I believe. Perhaps someone here with knowledge can shed some light on that. But banks typically won’t lend / underwrite the risk of a development unless there is upfront commits showing that there is a path to get their investment back. 70% is a bit high but you are correct in the fact that a bank will not finance a project until a percentage that could be as high as 40% has committed lease agreements but it also depends upon how much capital the developer is bringing to the deal as well. I wish I was a billionaire. I’d fund projects left and right downtown. You know you can sell the development a year after completion for millions in profit. And I’d spend that money on rail projects. When is Raleigh gonna build a real tower? It has been ten years since the PNC opened… I laugh whenever I read articles about building new towers in Raleigh and as you read on you realize their idea of a tower is 12 or 15 stories. Raleigh skyline is sooooo incomplete and needs at least another 10 buildings that are over 30 floors. What is the problem? Why does it seem like these developers are scared to do something serious in dt Raleigh? If Raleigh isn’t careful Durham skyline will end up being better than Raleigh in the long run…. Apparently Austin, TX had similar challenges at first. “We can’t build that high because it would change the character of the town or it would affect how the capitol looks like …” Guess what zoning was changed and now 700ft tower in place and more 40+ stories coming. Well, to answer Robert’s question “the problem” is that simply the market for a 6-700 ft building just hasn’t developed. No one has ever proposed a 700 ft building, even before the recession. There just isn’t demand for 500,000+ sq ft of space to come on at one time. Look at how hard it’s been to build shorter high rises. I think the new Edison office concept is beautiful and in a great location and yet it’s all conceptual. FNB Tower has taken forever, 400H, etc haven’t moved. I wouldn’t worry about it too much, though. There’s a 100% probability, given Raleigh’s current economic path, that the skyline grows up and out. I truly Agree with Both, Robert and Steve on Having tall High Rise buildings in Downtown. You have to lure Serious Developers in building a High rise that stands out, But at the same time, there isn’t a demand for one. A High Rise Hotel of 30 stories can be one, I’m sure there is a demand for Hotels in Downtown as well as Around the Triangle area. Raleigh can attract big name Developers to build a 40 Plus High rise in Downtown, But….for now we would just have to Deal with these 10 to 20 story tall high rises, And all the red tape and slow progress that comes with it. I’m sure John Kane would Love to build a 30 story high rise in Downtown. Just took a Look at the google pics that Mark, added here, Very Nice, I can See Raleigh have a few taller buildings like in the pic for example. I can see a few along S.Saunders and Wilmington streets as well as around Downtown. Really if you have any sense for the logical, organic progression for these things, it wouldn’t be a concern on that front either. FWIW, I think the price paid for 300 Hillsborough, the company involved, and the moving of the center of gravity downtown, sightly west, I think that’s your most realistic site for something approaching 40 stories, no matter who in the Borough thinks it’ll disturb their sleep. Being near the warehouse district is a much better selling point for leasing up companies than Fayetteville St in my opinion, as well. I definitely agree that the center of DT will move west. The conceptual rendering of the new city hall had a pair of 20 story buildings, and I’m a firm believer that when the N/O gets redeveloped, it’ll be at least 300 ft. I also agree that Fallon will deliver something sizable at 300 Hillsborough. Most of their current offerings are limited to 300 ft by the FAA and their Charlotte development is in the South End. 300 Hillsborough is their first chance to go big. There are other parcels, some small and awkward, that could definitely go tall if prices rise enough, and I think they will.